Clever Voter: Former Umno Youth chief Khairy Jamaluddin, just like everyone else, was confident of BN winning the 14th general election. Despite real evidence of how bad the problem of corruption has eroded institutional integrity, you had shown little concern. Even reports of missing persons did not seem to bother the BN authorities. Frequent outbreaks of financial scandals were not considered to be a political risk. 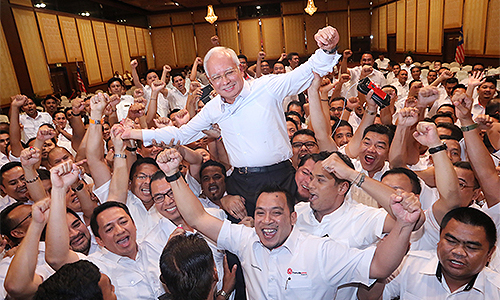 All of BN seniors were expecting to return to office. Even previous Treasury secretary-general Irwan Serigar Abdullah was seen in a video dancing in his red shoes. The party which Khairy belongs to did not think it was morally wrong to even lie or treat state resources as if they were theirs. Sure enough, everyone exaggerated their plans during the election campaign but the voters could tell who were telling bigger lies. Blaming former premier Najib Abdul Razak would be the natural thing to do, but that's not good enough. Everyone who had benefited ought to return the stolen goods to the country. It would not do any good to Umno as a party if senior party leaders were in denial. Khairy and rest would never understand moral standards and neither would they wish to embrace the decency of putting the country before self. So long as individuals like Khairy blame others, the party will slowly but surely die. It seems to be what they want. Why It Happens: There is no point saying things indirectly. If Umno has been making collective, honest and sincere decisions in the interest of members, Umno would not be facing what it is facing today. Nil Timbadia: Too little, too late. You never cared for Malaysians then and only speaking up now. Thankfully, God forbade another five more years of kleptocrats. Dai Jek Kong: Hyenas move in a menacing pack attacking and devouring victims that they can overcome. But when they become the hunted and food becomes scarce, they will turn onto themselves devouring the weak amongst them. Headhunter: Closing the stable door after the horses had bolted, what's the point? Isal: Khairy, BN lost not because of the 1MDB per se but because of your painful silence and glaring inaction on the matter. You and all your party colleagues are equally responsible. Jeez: Khairy did a good job holding Umno Youth in check when he was their chief. Traditionally Umno Youth was the extremist pressure group within the government if we were to look back in the days of Harun Idris and others. The ultra-extremists couldn't use it as a platform for their agendas; that's why we have so many so-called "NGOs" sprouting out – for example, Perkasa, etc - in the name of 3Rs (race, religion and royalty) to further the interests of certain politicians. Khairy maybe the only hope to have a credible opposition to keep Harapan in check, without which, will become another BN. Tell me, which politician can be trusted? We can only do with whatever best we have. So, go easy on him. Abd.Karim: Indeed, Khairy has been the only one, from the day BN lost, to have accepted the fact and moved on. He has offered constructive criticism in the Parliament instead of childish rantings and did not even stage a walkout when all else did it. I would vote him even if he was an independent standing at my constituency. Changeforgood: Yes, for the first time Khairy, you are absolutely right. Lakunan Tergendala: Khairy, please continue to voice out the truth or what you knew. People can accept Umno only if the leaders are willing to take responsibility and face reality. VGV: KJ, it's too late now to point your finger at Najib. You should have rubbed it into him on his wrongdoings much earlier. Even a layperson knew that Najib was the cause of the downfall of Umno/BN. You knew it too, and yet all of you supported him, including you, KJ. We all waited for the chance to show our displeasure at the ballot box. And finally, we got rid of Najib and Umno/BN. There is no use crying over spilt milk, KJ. Tell Najib not to blame others; he should blame himself instead. Vijay47: Reading the recent statements of various Umno leaders, I seem to be more and more reminded of that familiar cliche from Euripides, "Whom the Gods would destroy, they first make mad." Creeping insanity surely must be the reason for the abundant drivel being spewed, it cannot be dim-wittedness since even stupidity has its natural limits. We have Umno president Ahmad Zahid Hamidi of all persons holding forth on “trust”, and now we have Umno supreme council member Lokman Noor Adam who has revealed that the cause of Umno’s devastating defeat lies, contrary to Cassius, in all the stars in the sky, never in themselves. Needless to say, Najib remains steadfastly in similar attendance, his now constant delusion attributing such loss to a litany of others’ sins which in truth is a testimony of Umno’s entrenched ills; for good measure, he has taken to the TV so that the international community also can benefit from his astute unique observations – yes indeed, why hide the party’s light under the bushel? For comic relief, we have former defence minister Hishammuddin Hussein who Don Quixote-like will be riding off towards Cathay, when time permits, with the promise of retrieving the frolicking fugitive businessperson Low Taek Jho. For his part, Khairy suffers an identity crisis; unsure whether he be hare or hound, he keeps blowing hot and cold, reflecting occasional sense but alas, more frequent idiocy. And these, folks, are the gentlemen the nation has been fortuitously saved from, in the process reaffirming my faith in the divine.